Street vendors in Venezuela are weaving baskets from banknotes after 13,000 per cent inflation rendered them practically worthless. Inflation in the oil-rich Latin American nation has seen the economy spiral out of control, with its currency the Bolivar losing 87 per cent of its value against the euro. 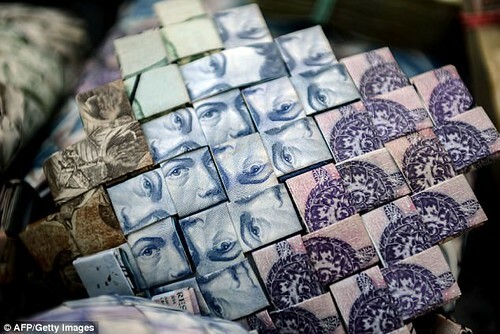 Cash is worth so little there bank notes are often seen littered on the streets. But street seller Wilmer Rojas has found a use for them. The 25-year-old is selling origami-style handbags, purses, hats and baskets - all made out of money. 'You can use magazine paper or newspaper pulp, but currency notes are better because they are not worth anything, they are all the same size and you don't have to waste time cutting them. With two, five and 10 bolivar notes 'you can't even buy a piece of candy', he added. Some of the woven creations sell for 300,000 bolivars - enough to buy a kilo of meat. 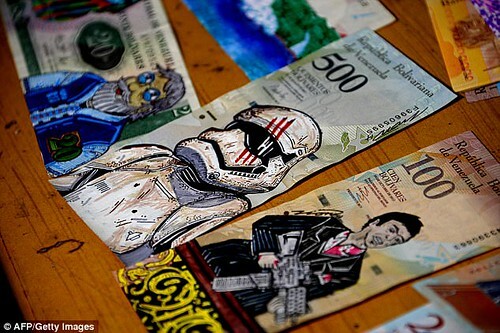 Jose Leon, a 26-year-old designer, draws the faces of Star Wars characters over the image of Simon Bolivar and other famous Venezuelans pictured on the notes. Foreign customers pay him up to £14 ($20) for each piece of 'money art', which he said increases the note's value by nearly 5,000 per cent.